There are some 75,000 Indigenous living people in Australia’s Murray Darling Basin and most of these people are Traditional Owners that belong to over 40 autonomous First Nations. These First Nations have a unique connection to the rivers and waterways of the Murray Darling Basin, including Australia’s biggest and longest rivers. The Murray Lower Darling Rivers Indigenous Nations (MLDRIN) is a confederation of sovereign First Nations from the Southern part of the Murray Darling Basin. MLDRIN is focussed on caring for our rivers and achieving water rights for Aboriginal people. The group includes delegates from 25 First Nations, from as far north as the Macquarie River, in Wiradjuri Country, to the Coorong and Lower Lakes on Ngarrindjeri Country in South Australia. 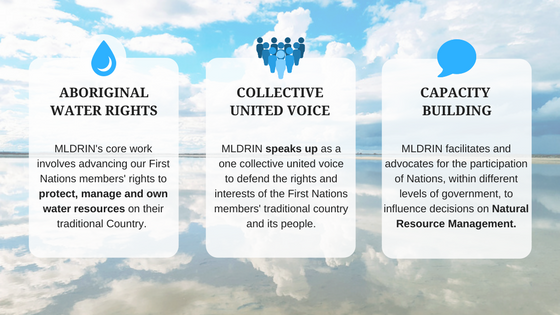 MLDRIN is an expression of the way First Nations and Aboriginal people have always done business – by caring for Country and talking to our traditional neighbours upstream and downstream on the Murray and its sister Rivers, Creeks, Lakes, Billabongs and waterways. Membership on MLDRIN Confederation is for recognised traditional groups or First Nations. These were also sometimes called “tribes”, “tribal groups” or “language groups”. You can view a list of our member-Nations here. #MenindeeLakes & #Darling➡️A good 'episode' in today's Murray-Darling Basin Royal Commission from 10AM - ➡️Theme 5: Efficiency measures &the 450GL, & ➡️Th. 7: Progress on Environmental Outcomes inc: a) Water recovery to date; b) #DarlingRiver & #Menindee Lakes; c) Ecological health of the #MDBasin.